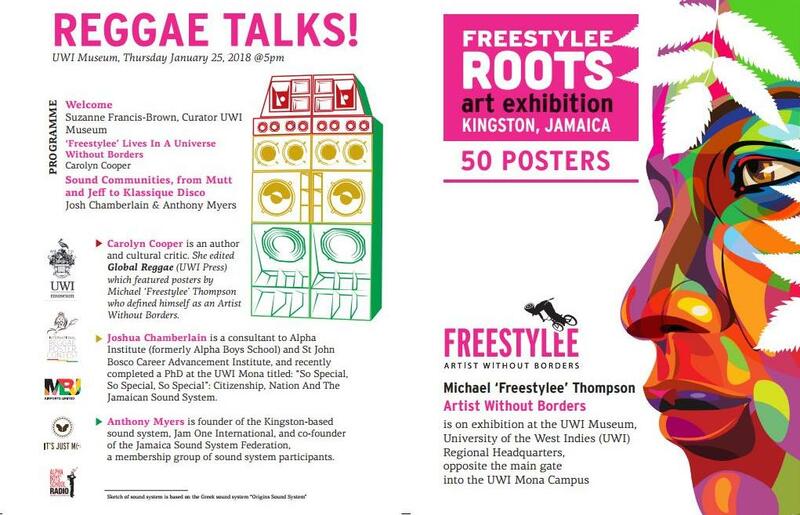 The work of Jamaican poster artist Michael ‘Freestylee’ Thompson, who defined himself as an Artist Without Borders, has been in focus within the UWI Museum, and we’re broadening the scope with a talk and discussion session we’re calling Reggae Talks! This takes place on Jan 25 at 5pm – just one day before we dismount the Freestylee Roots exhibition of a collection of 50 of Thompson’s works that has been up since December 5, and send them on their way north-west to the Montego Bay Airport which will be their future home. Thompson died in 2016, but his work capturing iconic issues and faces continues to attract viewers. Reggae music, revolutionaries and social activist causes across the world were his passion, as he reiterated during at talk at UWI in 2013 when a small exhibition of his work, featured in the book ‘Global Reggae’, was mounted at the museum. Thompson noted then that his posters were influenced by Cuban revolutionary posters which focus on simple design and a strong, socially conscious message.. The Reggae Talks! event will feature Cultural Activist and Author Carolyn Cooper speaking to Michael Thompson’s mission and work; and Joshua Chamberlain of the Alpha Institute (the new branding of the Alpha Boys School) and Anthony Myers of Jam One and the Jamaica Sound Systems Federation, on local sound communities. Dr Chamberlain recently completed his PhD in the Cultural Studies programme at the UWI Mona, focusing on Citizenship, Nation and the Jamaican Sound System.